How Do You Waterproof Your Decks? Waterproofing is typically a concern with wooden decks. The wood will absorb water, swelling and warping over time. 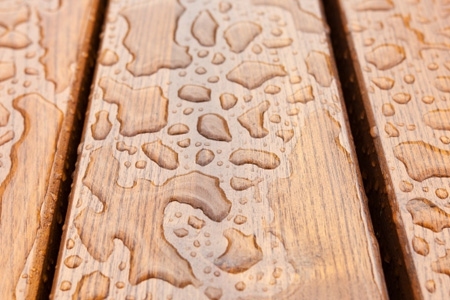 The water can also degrade the wood or cause mold or mildew to grow, causing damage and health concerns. Applying a sealer is a common solution, but there are many options for waterproofing your decks depending on where the deck is located and how the deck was designed. Some methods are simpler than others, but all are useful. No matter what method you use, it's important to prepare your deck properly. Inspect your deck for loose, creaky or obviously warped boards, then repair or replace them. Sand the deck, as well, especially if it is old or was treated with a sealer in the past. Having a smooth surface is essential and removing any sealer as much as possible is necessary for adding new waterproofing materials. Wash away all dirt with a deck cleaner, power washer, or both in combination. You must remove all dirt, mold and mildew. Deck cleaner will help restore the appearance of the wood and remove mildew and stains, such as rust from nails, but is hazardous and should be used with caution. The deck should be dry before using any waterproofing method. Wait for several days after cleaning a deck before applying water sealer. It's important to work on a dry day, as well, and better if it will not rain for several days after you apply the sealer. Applying water sealer is relatively simple. Stir the sealer thoroughly with a paint stir stick, then apply to the deck with a long-handled paint or stain pad or a roller with a long handle. Coat one or two boards at a time and go along the length of the boards rather than the width to avoid lap marks, which will show where you applied sealer in an unattractive way. Use a paintbrush to get sealer into corners. You can use multiple coats if desired. Some companies produce vinyl membranes designed to apply over decks. The advantage of this is that the area below the deck will be dry, and water will run off the edges of the deck only. This is particularly useful for rooftop decks or elevated decks, the underside of which you may want to use as storage. You can also purchase EPDM sheets for the same purpose. With vinyl, you may need a professional to apply the sheet for best results. With either method, you can cover the membrane with decking tiles. Decking tiles are usually elevated slightly to allow water to run through and to the waterproof coating underneath. While decking tiles vary, many are designed to simply snap together as a floating floor with no adhesives, nails or grout required, making this part of the process perfect for a do-it-yourself project. If your deck is made from plywood, you may want to consider waterproofing it with an elastic or rubberized paint. These paints both repel water and provide some extra safety in that they are not slippery. Application is much like that of regular paint. Stir the product thoroughly with a paint stir stick, pour some paint onto the deck, then spread it with an ordinary paint roller. Depending on your product, you may need a primer and a topcoat for best result. You can also add decking tiles over a painted deck, as you may find the color of the paint unattractive. Server responsed at: 04/22/2019 6:34 p.m.